Quantum Mind Power has been created by the top brain entrainment engineer, Morry Zelcovitch. I have tried many other programs, such as Holosync, and I find that QMP leaves them all way behind. It's by far the best and most effective, while being an entire system without the need to buy and re-buy another and yet another level. QMP was developed through years and founded on decades of expertise. It comes complete with different tones, so everyone can choose the one that suits them best for their individual needs or changing moods. What is brain entrainment anyway? It is a sound technology that adjusts brain waves on purpose. For example, a deep meditation state ranges in theta wave frequency, now, normally it takes years or even decades of meditation practice to achieve this level while staying fully conscious. Brain entrainment is a profound shortcut, as it takes just a few days to adjust the brain waves while staying awake. All you have to do is to use it regularly, for at least a few months, to experience significant changes. There is nothing else required than good headphones and a quiet place to relax and listen. The effects are tremendous. The sound waves can be sensed through the whole body, like a gentle massage in the energy system, massaging away stress, blockages, even pain (energy blockages) from the inside out, while synchronizing the hemispheres and deepening the meditative state. Solutions to problems, creative ideas, new insights or inspirations start to flow. - I feel much more in harmony and centered than ever before, and over a longer time period, with a state of deep inner peace, even in challenging situations. Instead of falling back into reactions if someone triggers my "hot buttons" I experience instant awareness that enables me to stay heart-centered or at least realize if I react from memory and switch back to higher awareness in just seconds. Difficult circumstances simply dissolve with ease now. This alone is a blessing. - I am lesser and lesser identified with "outside" circumstances and easily able to let go of attachments, becoming detached, which results in a deep relaxation within my innermost levels of being. - A real miracle is that I watch myself being patient and calm in situations that made me getting impatient. Especially if I had a long to do list and did tend to fall into inner stress and the feeling that there is never enough time to do everything that needs to be done, I am now serene and simply let the flow work for me, releasing worries about things that I can't do right now, doing what I can do now and leave the rest, with keeping a clear mind. My entire time management has changed to the better. - A big blessing is also, that I can deal much better with people with low energy frequencies, without getting involved or pulled down, and so do not feel anymore like "fight and flight", but can stay calm and kind, while keeping my energy field protected. - My energy level has increased big time. With ease I can just switch back if I feel my energy is about to go down, with a simple alignment of my chakras with my Higher Self, in just a second, opening my crown chakra and get showered with endorphins. - The cleansing process of old undesired patterns and installing consciously chosen beliefs has become a joyful adventure instead of hard work with countless repeats. - Focusing becomes more and more easy and clear. I feel distractions of the inner chatter falling away and instead my mind expands as clear as the sky. Generally I also have the physical sensation of my brain being kind of flexible, so that old structures dissolve smoothly and I have control over the creation of new neural pathways; synchronizing both hemispheres and accessing the unconscious fast and easy. In other words, the harmonious alignment between subconscious, conscious and higher conscious is clear and effortlessly accessible. One of the side effects is, that 30 minutes QMP is more refreshing than 5 hours of sleep. I feel the deepest inner peace and the sweetness of the source energy expand. This is difficult to describe - an awareness of the divine, of "I am and there is nothing to find, to accomplish, to need. Everything IS already, I just allow myself to be who I really am and always have been". Sweetness dwelling up from the divine source and the awareness that we ARE enlightened beings. There is nothing to find or to add. All there is to do is to just let go of everything that is NOT real, that blocks the flow in the energy system, that creates a deep tension, within which we identify with because it seems "familiar". Let go and the true eternal Self shines through. 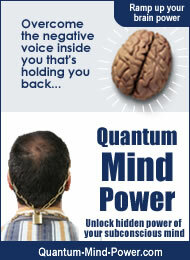 Quantum Mind Power can totally transform your life without requiring any willpower or effort on your part. You can now experience the same peaceful, enjoyable, deep meditation that only skilled Zen Masters have had the privilege of experiencing. This results in the power to tap into your subconscious mind and program yourself for success, to attract an abundance of health, wealth and happiness. If you have tried everything else, get this one. You will be delighted with the results.